Many Blackberry users across the world has started reporting that the Whatsapp application has stopped working on their devices, despite the fact that Whatsapp officially announced that its support for Blackberry devices (BB10), Nokia Java S40, and Nokia Symbian S60 has been extended until June 30, 2017. Blackberry 10 users now get a flash page announcing that WhatsApp no longer supports their phone. What a sad one there! However, some other Blackberry 10 users also reported that they are being able to use Whatsapp on their device, while some others reported that after updating their WhatsApp from BlackBerry World, they were able to use Whatsapp again. If WhatsApp has stopped working on your BlackBerry 10 smartphone, you might want to give that a try. Update the app and see if that resolves the issue. 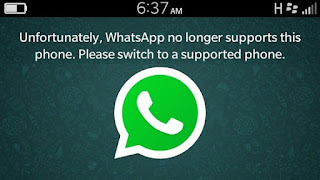 If an update does not resolve this situation, then perhaps WhatsApp has finally dropped support for BlackBerry 10. In which case, it is time for you to switch to a supported smartphones like Android OS, Windows phone, iOS, iPad, and even Apple iPhone. Are you still using Blackberry 10 device? Are you still able to use Whatsapp application? Kindly share your experience with me using the comment box below. Trick to make Whatsapp work for BB10. Download Whatsapp for Blackberry 10. WhatsApp working on BB10 phone with new trick. Download Whatsapp for Blackberry and make it work. I HAVE ALREADY SOLD MY BLACKBERRY!! !